Illinois State alum Brian Selke showed off a pair of metallic boots to a group of old friends inside of Uptown’s University Galleries before he is fully transformed into his musical alter ego ‘Dr. Weed,’ one third of Chicago-based band The Gold Web. Jeans and a t-shirt were a high contrast to his face, which was caked with silver face paint and glitter, just one part of his usual performance costume. Later in the evening, Selke seemed almost unrecognizable. Dr. Weed dons a more artistic outfit, complete with an octopus-like headpiece and rainbow fur shoulder pads. The rest of The Gold Web were dressed in similar getups, which brought even more of an artistic flare to the gallery than usual. Thursday evening’s at University Galleries are generally quiet, with noises usually only coming from the chatter of visitors, lecturers, or the art itself. 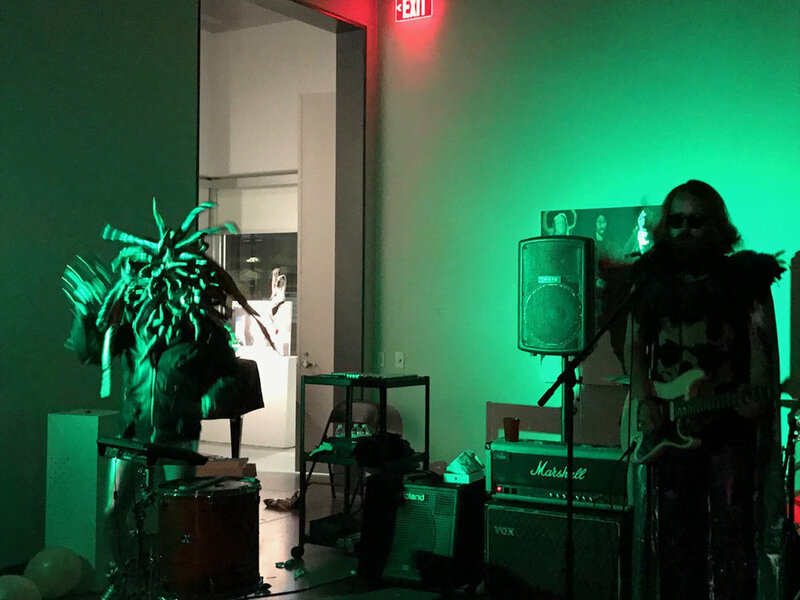 Last week, however, the gallery opened it’s doors to loud local music, bringing in a sizeable and diverse crowd to hang out after-hours. The promise of local live music is always likely to attract ISU students, but Selke’s alumni status and The Gold Web’s city fan base generated a more eclectic crowd of partiers. Many of the audience members of all ages dressed in outfits mirroring the band, including sophomore art history major Sheldon Gooch, who choose to wear both a shimmery silver wig and piecey red metallic jacket to the show. ‘The Gold Web’ shared a performance with it’s audience members that was interactive and mesmerizing, throwing confetti into the crowd and encouraging everyone to form into an eventual group dance party. A favorite of the night appeared to be the band’s cover of David Bowie’s track ‘Rebel Rebel’, mirroring another artist who was famous for using glitter and alter egos in music. 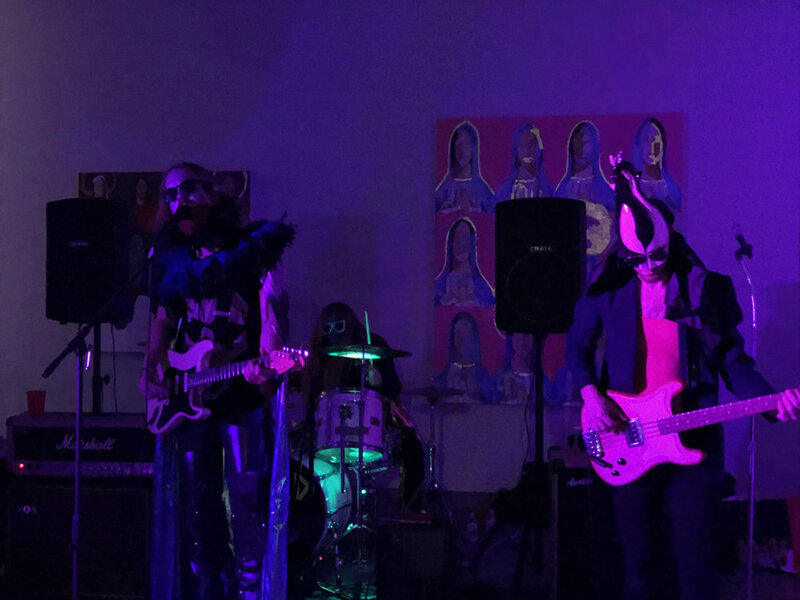 Normal has it’s fair share of eccentric art shows and local music performances, where local students and community members who are lucky enough to have discovered them seem to come back again and again to support spaces who host them. The Gold Web can be found on Spotify and Bandcamp.